This is in continuation to my previous post on Diseases of apple: White root rot Management. In today’s post we are going to discuss about the Premature Leaf Fall. Description: Pre mature defoliation in all apple-growing states of Himachal Pradesh, Jammu and Kashmir, Uttarakhand and North- east in recent years. The disease is caused by fungus, Marssonina coronaria and Alternaria mali resulting in mid-season pre mature defoliation. Its affects all the commercial cultivars grown in India. Disease appears both on leaves and fruit. Dark brown patches having pin head fruiting structures, develop on upper surface of leaves varies from 5-10 mm diameter typical blotch symptoms. 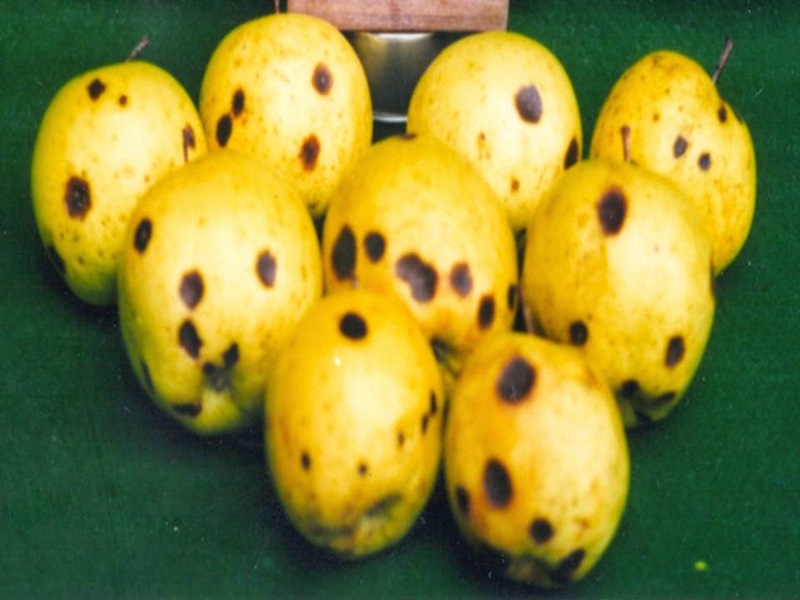 Various small and large blotches depending on the climatic conditions after the initiation of disease coalesce to form large dark brown blotches and the surrounding areas turn yellow. The yellowing advances towards petiole end, developing abscission layer and induce mid season defoliation. It reduces the fruit size and delays ripening. The fruits are poorly coloured and lack flavour. Irregular necrotic blotches on mature leaves characterize the disease. The blotches develop suddenly and increase rapidly during June-July (high humidity and high temperature) and cause yellowing and defoliation. The mid-season defoliation may be responsible for poor growth and development of fruiting buds and result into low productivity in ensuing year. Infection of the fruit appears in the harvested fruits and dark brown depressed spots are most common on ‘Golden Delicious’. In coming post we shall be discussing about the disease cycle of premature leaf fall.